Songwriter et chanteur Country US né Jerry Donald Chesnut, le 7 Mai 1931 à Loyall, Harlan County (Kentucky). Country songwriter Jerry Chesnut was born in Kentucky on May 7, 1931, and he spent much of his early life following his father around the coalmining camps in eastern Kentucky. He served in Korea, and worked for a railroad in Florida during the mid-'50s, writing the occasional song. Chesnut moved to Nashville in 1958 to make it in the music industry, but spent nine fruitless years until Del Reeves recorded his "A Dime at a Time" in early 1967. 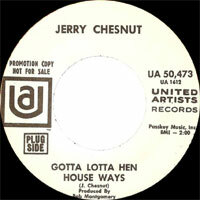 By the end of the year, the song had peaked at number 12 in the Country charts and Jerry Chesnut had a hit on his hands. Over the next three years, Chesnut wrote hits for Roy Drusky ("Weakness in a Man"), Porter Wagoner & Dolly Parton ("Holding on to Nothin'") and George Jones ("If Not for You"). In 1968, two of Chesnut's songs were recorded by Del Reeves; "Looking at the World Through a Windshield" and "Good Time Charlie" both hit the Top Five. Chesnut parlayed his success into an artists contract with United Artists in 1969. He recorded a few unsuccessful singles during 1969-70, but returned to songwriting soon after, writing "A Good Year for the Roses" for George Jones, "The Wonders You Perform" for Tammy Wynette, "Oney" for Johnny Cash and Chesnut's first number one, "It's Four in the Morning," for Faron Young. Jerry Chesnut won Billboard's Songwriter of the Year award in 1972, and 20 years later received induction into the Nashville Songwriter's Association Hall of Fame.